The forging of aluminium alloys is the process of converting a uniform blank shape into a final product by hammering the material between shaped or flat dies. This working process may take place in one stage or several stages. The great majority of aluminium forgings are made in the heat-treatable alloys, but forgings in pure aluminium and in some of the non-heat-treatable alloys find application in certain fields. The technology has now reached an advanced stage of development, and precision forgings are used for many highly stressed parts, such as in aircraft undercarriage gear, internal combustion engines and other power units. Forged components have an advantage of near net shape, minimising further machining. Aluminum alloys are produced by all of the current forging methods available, including open-die (or hand) forging, closed-die forging, upsetting, roll forging, orbital (rotary) forging, spin forging, mandrel forging, ring rolling, and forward and reverse extrusion. Selection of the optimal forging method for a given forging shape is based on the desired forged shape, the sophistication of the forged-shape design, and cost. Most aluminum alloy forgings are produced in closed dies. The four types of aluminum forgings shaped in closed dies are blocker-type (finish forging only), conventional (block and finish forging or finish forging only), high-definition (near-net shape produced by forging in one or more blocker dies followed by finish forging), and precision (no draft, net shapes produced by forging with or without blocker dies followed by two or more finish forging steps in the finish dies). Blocker-type forgings are produced in relatively inexpensive, single sets of dies. In dimensions and forged details, they are less refined and require more machining than conventional or high-definition closed-die forgings. 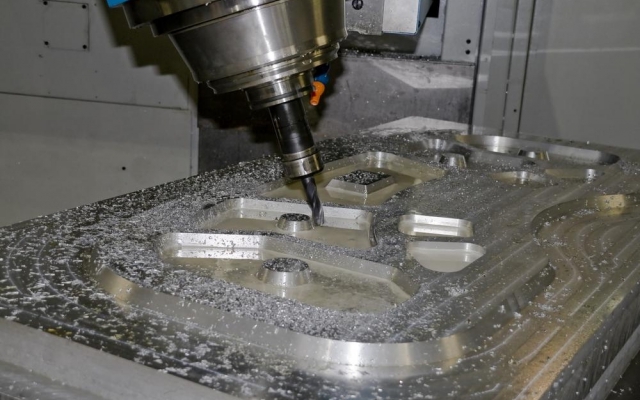 A blocker-type forging costs less than a comparable conventional or high-definition forging, but it requires more machining. Conventional closed-die forgings are the most common type of aluminum forging. They are produced with either a single set of finish dies or with block-and-finish dies, depending on the design criteria. Conventional forgings have less machine stock and tighter tolerances than blocker-type forgings but require additional production costs, both for the additional die set and for additional forging fabrication steps required to produce this type. High-Definition Forgings. With the advent of state-of-the-art forging press and supporting equipment and enhanced forging process control, as are discussed below, high-definition, near-net-shape, closed-die forgings illustrated can be produced. High-definition closed-die forgings offer superior forging design sophistication and tolerances over conventional or blocker-type forgings and therefore enable even further reduction in final component machining costs. High-definition forgings are produced with multiple die sets, consisting of one or more blocker dies and finish dies, and are frequently used in service with some as-forged surfaces remaining unmachined by the purchaser. The deformation behavior of aluminum alloys differs from that of other materials; therefore, the intermediate and final cavity die designs must optimize metal flow under given forging process conditions and provide for the fabrication of defect-free final parts. Allowances for shrinkage in aluminum alloys are typically greater than those for steels and other materials. Temperature control of the dies used to forge aluminum alloys is critical; therefore, the methods used for die preheating and maintaining die temperatures during forging must be considered in the design. 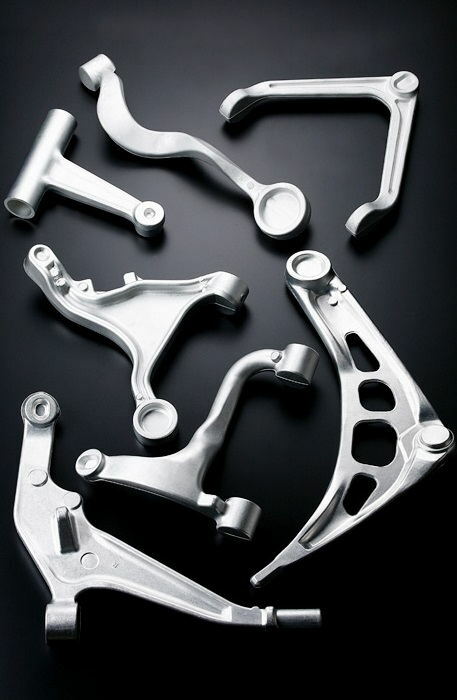 The die materials used in closed-die forging of aluminum components are identical to those employed in forging steel alloys except that, because of the higher forces applied in aluminum alloy forging and the design sophistication of the aluminum parts produced, the die materials are typically used at lower hardness levels in order to improve their fracture toughness. Commercially available die materials were primarily designed for the forging of steels and are not necessarily optimized for the demands of aluminum alloy forging processes. 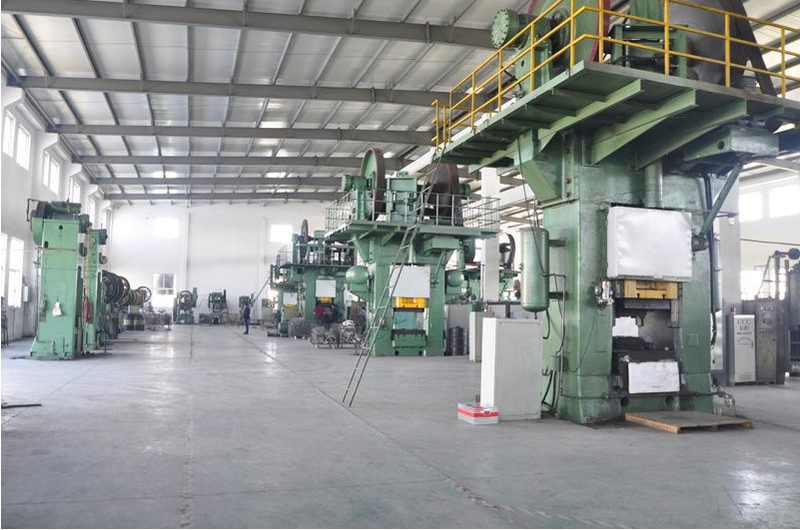 However, with advanced steelmaking technology, such as argon oxygen decarburization refining, vacuum degassing, and ladle metallurgy, the transverse ductility and fracture toughness of available standard and proprietary die steel grades have been improved dramatically. As a result, the performance of these grades in the forging of aluminum alloys has also improved dramatically. Although die wear is less significant with aluminum alloy forging than with steel and other high-temperature materials, high-volume aluminum alloy forgings can present die wear problems in cases in which die blocks have reduced hardness in order to provide improved toughness. Therefore, higher hardness die inserts and/or cavity surface treatments comparable to those used for steel forging dies are often used to improve wear characteristics in order to maintain die cavity integrity for aluminum forging dies. The surface treatments employed include carburizing, nitriding, carbonitriding, and surface alloying using a variety of state-of-the-art techniques. Beyond die wear, the most common cause of die failure in aluminum forging dies is associated with die checking or die cracking, which, if left unheeded, can lead to catastrophic loss of the die. Such die checking usually occurs at stress risers inherent in the die cavity features from the design of the forging being produced. Improved toughness die steels, improved die-sinking techniques, improved die design, and lower hardness die blocks serve to reduce the incidence of die checking in dies for forging of aluminum alloys. Numerical modeling of the dies, using state-of-the-art finite element methods (FEM) techniques, is widely used for analysis of die stress, die strain, and thermal conditions as a function of the die design and forging process conditions. With these analytical models, optimization of the die design and/or forging process conditions can be fully evaluated prior to actual die sinking and shop floor use, dramatically increasing die life. Further, aluminum alloy forging dies with die checking or cracking are routinely repair welded using metal inert gas, tungsten inert gas, or other welding techniques. With weld repair and numerical models of the dies, it is possible, through weld rod composition selection, to modify the performance capabilities of critical areas of the die cavity that models have shown to have high stresses or unavoidably severe stress risers. AL 7075, AL 7A04, AL 2A14, AL 2024, AL 2014, AL 6061, AL 6063, AL 6082, AL 2A50, AL 4032, AL TF10B etc. As an economic means of designing and making a shape. Machining can be eliminated and a high production rate can be achieved. Designs can be produced that eliminate the need for joints and welds. A high strength to weight ratio can be achieved. The act of forging produces a fully wrought structure improving the shock resistance and fatigue resistance. The surface finish is good and the elimination of porosity ensures pressure tightness. This combination of good mechanical properties, dimensional accuracy and surface finish means that aluminium forgings are used in highly stressed parts where structural integrity is of paramount importance. The alloys commonly used for these highly stressed applications are from the 2000, 6000 and 7000 series. The aerospace industry is a major end user. Like steel forgings, aluminum forgings may also require heat treatment to achieve a certain properties. T6 heat treatment is the typical heat treatment way after aluminum forging. Heat treating of aluminum forgings depends to a great extent on the type and grade of aluminum forgings. Main purpose of heat treating stainless steel castings is to relieve stresses, improve mechanical properties or facilitate machining. The processes generally produce nearly uniform properties throughout the forging, and are not used for localized effects such as surface hardening. Note: Before heat treating operation, surface cleaning is necessary performed on aluminum forging blanks to remove oils, grease, and other types of residue. Left on the aluminum forging surface during heat treating may affect the properties of products. Although aluminum forgings after closed die forging process can achieve a higher size accuracy and surface finish, it does not mean machining can be saved for all the aluminum forged products. Machining will have to be performed when there is a closer tolerance and surface finish requirement that forging can not meet. Our drop forging factory has built a reputation to do machining after aluminum forging. Our specialized machining services enables us to manufacture aluminum forgings with intricate geometry and detail, while maintaining high precision and accuracy. Our company has equiped with full sets of machining equipmement from manual turning & milling to complex CNC machining services. We offer the capabilities to machine aluminum forgings from several ounces up to 50lbs. Inspection after machining is also very critical, we utilize manual inspection equipment and gages as well as the latest in coordinate measuring machine (CMM) technology to measure and record all the dimensions. This ensures our customers always get the quality they want. The most widely used surface treatment method used to clean, or polish the surface of stainless steel castings. Low cost. A kind of surface treatment that refines the surface of aluminum forgings. The surface smooth of sand blasting looks better than that of shot blasting, but higher cost. Anodization treatment: Used to remove surface tiny burrs and improve the brightness of aluminum forgings. The surface looks smooth and a bit shining. CFS Forge can supply custom service for any shape aluminum products to our customer designs in any aluminum alloys, We are vertically integrated by offering closed die drop forging, heat treatment, inspection, machining and surface treatment. We have the ability to provide forged components complete finished and install to your equipment. We mainly produce OEM and Aftermarket aluminium forgings for Automotive and Aerospace industry, with high quality and very competitive price. Pls contact us if you have such purchasing demands.